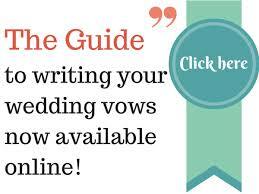 It can be hard to write from the heart, even for the Bride, and even though there is nothing wrong with the traditional wedding vows which are classic, sometimes you just want to mix it up and do something different. Many couples choose to write their own vows, but how do you become inspired or get over the writer’s block keeping you from writing from the heart? One easy way to get inspired and get rid of the writer’s block that is keeping you from writing your deepest heart felt vows for the love of your life is to write a list of all the things you love about your Groom. This can inspire you to write your vows based on your husband to be and the promises you want to make to him and him alone. The simple list can include things like the way he smiles, the way you feel when he hugs and kisses you, or what you feel when you look into his eyes. Another recommendation for losing the writer’s block when writing your vows is to read books that are full of love poems and quotations. You can even include these in your vows. Some couples write poems to each other as their vows and others read poems that were written by Shakespeare and many other great love poem authors. While this is just a suggestion, it can definitely inspire you to write about the one you love. Many movie quotes are a good starter for your vows as well, from Casablanca to Love Actually, each has its perfect opener that made us emotional when we watched the lovers on the silver screen share their feelings. While you and your Groom may not be Romeo and Juliet, you can have the perfect ending that they never had the chance to have. Writing your vows can be the hardest thing to do when you are solely focused on your vows alone, but if you focus on your Groom, your vows can be magical. Here is an example of a wedding vow that will help you get inspired to write your own. I promise that I will always be loyal, loving, and true. My deepest hope for us is that we grow old together and that we are as in love then as we are now. While this is just one example, you can find many other inspirational wedding vows online. You can even talk to friends and family members about their relationships and wedding days to get inspired by their Big Day. Each of these ideas will get you started on your vows, but they should be from your heart and your heart alone to make them truly special and unique. Category DIY Speeches | Tag DIY Inspirational Vows, Inspirational Vows | Bookmark the permalink.